With its abundance of natural lakes and rivers, Bend is the perfect place for anglers looking to cast their line in an idyllic setting. The area is also rich with all sorts of fish species, including an array of trout, bass, and salmon. Learn more by reading on down below! Bend Oregon’s Fishing scene varies from bait and bank fishing to fly and canoe fishing, with relatively equal popularity. However, specified styles of fishing are only permitted in certain locations. Just a short drive away from Bend into the forest-covered mountains nearby, you’ll find a variety of lakes that are well-known for their plethora of fish. Sparks Lake is about thirty-five minutes away from Bend, and renowned for its brook trout and cutthroat trout. Fantastic scenery encompasses all of this for a truly scenic experience. It’s an ideal place for fishing from canoes or small boats, but you can only fly fish here. Slightly further away is Devil’s Lake—about forty-five minutes away. It’s a small lake that’s ideal for bank fishing for species like rainbow trout and brook trout. It’s also very family-friendly. Lakes like Hosmer Lake, Elk Lake, Big Lava Lake, and Little Lava Lake are about an hour away from Bend, but worth the drive if you’re interested in a stunning day-trip setting for fishing in Bend Oregon, natural sightseeing, and even other water sports. Hosmer Lake is a fly fishing only lake famous for Atlantic salmon, while Elk Lake is home to kokanee and is perfect for sailing, swimming, and wind surfing as well. Take in serene views of Mt. Bachelor, South Sister, and the Deschutes River from these spots. Sites like Farewell Bend, First Street Rapids, Drake, Pacific, Riverbend, Pioneer, Sawyer Parks, and Miller’s Landing are all ideal for fishing along the Deschutes River, which can be easily accessed from town. In Bend, you can even fish in town! Several local parks in the city offer fishing, including youth fishing for anglers ages seventeen and under at Shevlin Park and all-ages fishing at Pine Nursery Park. Shevlin Park is great for rainbow trout, while Pine Nursery Park has bluegills and bass, in addition to rainbow trout. The only downside of fishing at these parks? Anglers who fish here have a limit of two fish per day, with a minimum length of eight inches. 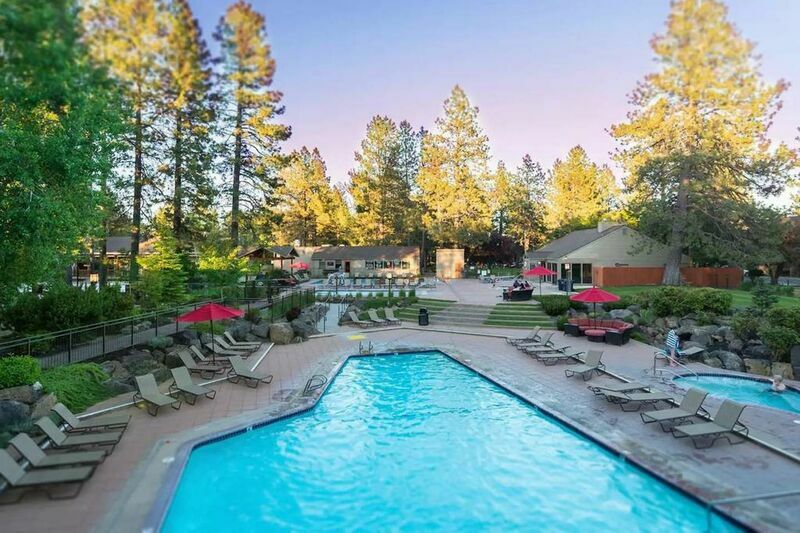 Contact our office for additional details on fishing Bend Oregon and other neat sports, activities, and attractions that Bend has in-store for you when you reserve your stay in one of our charming vacation rental properties today!